At American Chem-Dry, we understand that your delicate fabrics are an expensive investment that, unlike regular carpets and upholstery, can last up to 150 years or more with proper care and attention. 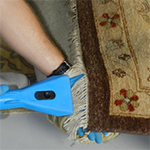 With patented tools and equipment designed specifically for area rug cleaning, we provide a thorough and effective, yet gentle, cleaning process that is powerfully soft. 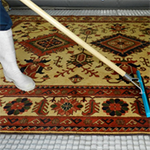 Depending on the particular fibers, dyes, soils, and construction of the rug, we’ll draw from the cleaning techniques described below. 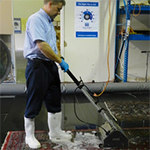 First, we dust the rug to remove all the insoluble soils such as sand, pet hair, dust, etc. 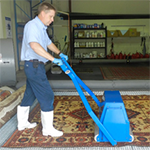 As much as 79% of the dirt in a rug is dry particulates that can be removed using the dusting process. Dusting rugs can be the most labor-intensive part of cleaning process. After dusting, the rug is thoroughly vacuumed. Next, the rugs are washed in our specially designed 300 square foot rug bath, using cleaners specifically designed for the delicate fibers of fine oriental rugs. 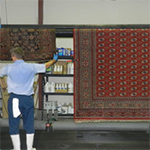 The rug is then hung on the drying racks until it is thoroughly dried using high speed fans in a controlled environment. Next, the cotton fringe is washed by hand and rinsed. The rug is then given a final vacuuming and grooming and is thoroughly inspected. Any stains that didn’t wash out are individually tackled with specialty stain removers.